It is time for “the Greatest (and Greenest) Show on Grass.” The ‘greenest’ part is a new addition to this now long-sounding tournament tagline, and was added some time after Waste Management took over as the tournament sponsor and turned this raucous, hot-mess of an event into the most sustainable, eco-friendly stop on tour. That is saying something, considering the course sees a whopping 500,000+ spectators come and go throughout the week, and further considering the undeniable fact that this tournament is known as one of the loudest and wildest events of the year. That loud and wild of an environment can only be created, and exacerbated, by the consumption of millions of plastic cups (as well as a specific drink that usually goes in them). 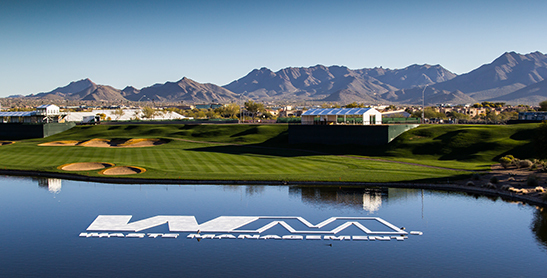 If you have never tuned in to the Waste Management Phoenix Open before, WATCH it this year. You will not be disappointed, especially if you enjoy this scene in Happy Gilmore, or this atmosphere at the Ryder Cup. In fact, just to get the “party” rolling, take a look at some memorable moments from the tournament. The WMPO is best known for “the loudest hole in golf,” the 16th hole, an unassuming, 160 yard par 3 that has turned into one of the most exciting atmospheres in the game. This year, we have as star-studded a cast as the greatest show on grass has seen. Understandably, the headlines are consumed by Tiger Woods making his PGA return, and first return to this tournament since 2001. Excited as we are to see how Tiger’s game unfolds, you will not see any further mention of him in our predictions – if 2014 taught us anything, Tiger’s game has entered the “wait and see” category, though as always, nothing would surprise us. We will also get our first looks at Rickie Fowler and Jordan Spieth, two of the most highly anticipated golfers of the season, and perhaps some other big names, like Bubba Watson, Jason Dufner, Keegan Bradley, Hunter Mahan, Brandt Snedeker, or Billy Horschel can get things going in Arizona. Only the next 108 hours will tell. We decided to continue our strategy of “going against the grain” with our picks. Sure, we have some big names on the board, but they aren’t exactly the big names you’d expect. Even in such a strong field, there are going to be serious favorites this week: Bubba Watson will be expected to get revenge on his own collapse last year, crowd-favorite Phil Mickelson is hard to bet against in Scottsdale, and Jordan Spieth comes in after winning the Australian Open and the Hero World Challenge late in 2014. Although certain things, like Padraig Harrington kicking footballs into the crowd, have been banned on the 16th hole, expect a good time to be had by all. Photo courtesy of nytimes.com. Zach Johnson. Hard to believe a player like Zach Johnson could ever fly under the radar, but alas, here we are. Johnson has gotten off to a tough start in 2015, missing the cut last week, and finishing in an irrelevant T64 at the Sony Open. But ZJ doesn’t stay down long, which is exactly why we think he is going to fly under the radar to steal a win in Phoenix. Unless he’s hiding an injury… gosh we hope not. Rickie Fowler. Probably the most heavily favored player we took for this week. Do we think Fowler is going to jump right into 2015 with his second win on the PGA Tour? No (well one of us, who drafted Fowler second overall, might). But we do believe in the new-and-improved Butch Harmon-Rickie Fowler. This Rickie Fowler has played solid golf, through top 5 finishes in all four majors, to top 10s in both the November WGC and the Hero World Challenge. And frankly, Trickie Rickie is a fun guy to root for, especially in this tournament where he will get into it with the fans, so we’re going to give him a shot. Scott Piercy. Coming off an injury that kept him out of the ropes for most of 2014, Piercy is at the top of his game early. He has two top 10s, including the solo runner-up in Hawaii, and returns to a course where he’s had plenty of success in the past. In seven career starts, Piercy has three top 10s, has never missed the cut, and even had a T15 last year before his injury. Brian Harman. Okay, chalk up Brian Harman as our big flier pick… Harman has only had two starts on this track – a missed cut last year, and a T32 the year before that. But as one of our projected break-out players this year, we think Harman has the kind of game, and personality, that would lend itself to such a pressure-filled, raucous environment that is the Waste Management Phoenix Open. He’s also a lefty who went to UGA, which can’t hurt. Matt Kuchar. How do you not put Kuchar in one of 8 possible spots (technically 5, because he’s a lock to be in the top tier on Golf Channel for the forseeable future)? We’ve already used him twice on PGATour.com, and want to save some use for the summer, but it seemed impossible to pass on him here when he continues to be lights out every week. Maybe this will be the week he lets us down, but we doubt it. Zach Johnson. You know it’s a strong field when there are players like Zach Johnson, Hunter Mahan, Keegan Bradley, and… Tiger Woods… in the second tier. Well, in maybe the toughest tier to predict thus far, we are going to stick with ZJ, our prized pick from the PGATour.com league. Brendan Steele. Granted we had no idea about this until researching on ESPN’s website a little bit, but Steele has some seriously strong juju on this course. He’s been in the top 10 for three straight years (3 out of 4 tries), and he’s coming off a runner-up at the Humana. Sometimes these are the kind of “clever” picks that can burn you in the fickle sport that is golf, but in the third tier Steele appears to be the best guy on the board. Pat Perez. Somehow, thanks again to the strength of the field this week, Perez fell to the fourth tier. We’ve said it before – Perez is one of those guys who just feels good in the first two months of the year. Part of that is personal history; Perez was born in Phoenix, spent a lot of time in California growing up, and went to Arizona State for college (the chants of ‘ASU’ will be just as – okay, nearly as – loud for Perez as they will be for Phil), but regardless, TPC Scottsdale is definitely a place where he feels at home. It is rare to find such a horse for the course in the bottom tier, and one who is coming off a runner-up finish, which Perez is.